Thanks to the incredibly generous community here and the support of the biology department here at Middleton High School, I have the chance to set up a reef tank in one of our biology classrooms, where it can be seen in class and in the hallway! I will be using this thread as a way to make some updates and keep track of the build as we move forward, but heres whats going on for now! Right now we are in the process of figuring out something to place inbetween the counter and stand to raise it up. Once I get a chance to come in and work in the shop I should have a good way to raise up the tank so that it no longer sits behind the metal window frame which looses a lot of the look from the hall outside (a common meeting area for students). As of now I do not plan to drill unless someone can get back to me about a hole saw, I dont have one unfortunately and am not comfortable drilling the schools tank with a bunch of dremel bits. Some kind of skimmer that I need to jurry rig into the tank somehow. Right now thinking of doing an "In tank" sump by building a box and silicone it to one of the sides facing a wall. Going to keep it basic, with a decent amount of fleshy corals that really show off how alive they are. I dont have the resources or interest to do SPS! Display macro, maybe some feather algae since I cant do a refugium above the tank and have no way to drill it. So far we are still gathering everything together, salts ordered and we have a big RO unit here at the school. Once we get the booster seat built for the tank I should be able to get some sand, rock and water in and let the cycle begin! My gameplan is to let it cycle for a while before adding some basic softies as a trial run. 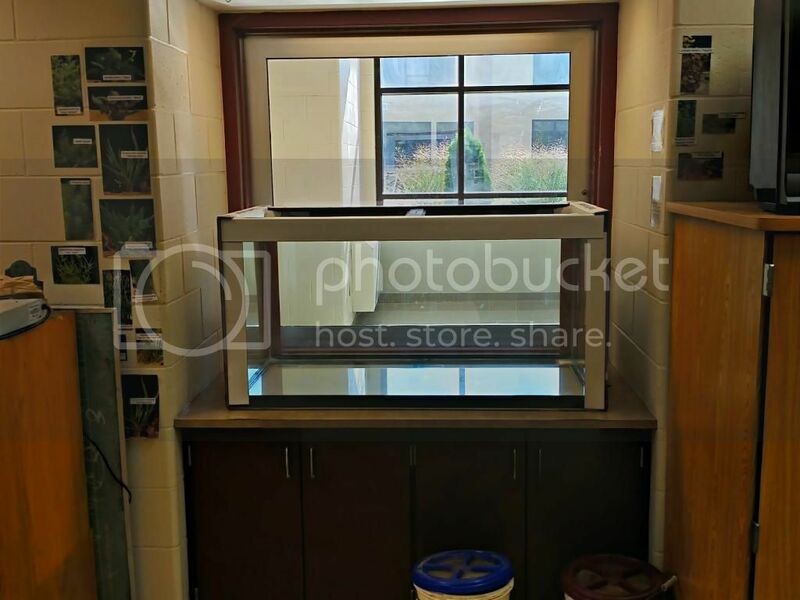 I will certainly be looking for some advice on scaping since I would like the tank to be primarily enjoyed from the hallway side (opposite side of the picture) but also be enjoyable from the classroom. Im also going to take down all those FW species ID cards and get some salty pictures printed along with some information about reef chemistry. I've got several sizes of glass hole saws - let me know what size you are looking for and if I've got it, you are welcome to it. did you end up using my sump for this build? ice fish wrote: did you end up using my sump for this build? I'm pretty sure I have the following sizes: 8mm (not for bulkhead), 45mm (1.75" for 1" standard bulkhead), 50mm (just under 2", for 1" schedule 80 bulkhead) and 60mm (2 3/8", for 1.25" schedule 80 bulkhead). Send me a message about what you want and when you'd like to get it. Thought I would post an update on this, work has been coming along on the tank slowly but surely, impeded mainly by a lack of LR and minimal access to the room (This classroom is used all day so it makes finding time in there difficult). So far the sump needs to be plumped in, but I need to cut some deeper overflow slots before I can do that. Aside from that the tank is going with some base rock that I seeded, along with a decent amount of flow and one of the halides fired up. My next plans for this involve cleaning up the sump (students ask to help, but then shy away when I ask them to do this one ), and then getting that plumbed in. Once thats done, I need to find some LR at a reasonable price, the school doesnt have the budget to get it from LA and its hard to do cash transactions with school funds, which makes buying it on CL or here harder. We may get a big box of base rock and just let it slowly seed in the tank, adding livestock slowly as it improves. I filled the overflow based on an idea I saw somewhere about using that extra space as a DSB, I figure I can try growing some mangroves in there as well, as one problem this tank is going to have is that it gets a good amount of natural light throughout the day. Current tank shot, most of the equipment will be moved below once the sump is added on.